Posted on March 12, 2015 by Matt Frazier / This entry was posted in Uncategorized and tagged american spirit, bugler, cigar, cigarette, loosey, rolling, smoke, smoke shop, tobacco, TOP. Bookmark the permalink. Bushwick, REJOICE! Although we don’t recommend trying the above mentioned way of smoking, you can now shop an extensive range of cigars down at Sunflower Pipes! With incredible brands, including Olivia, Punch, Perdomo Habano, Macanudo, Romeo Y Julieta, Decade, Dutch Masters, Games, 1882, and Entourage, there’s never been a better time to come to the store, and pick up one for enjoyment or celebration! 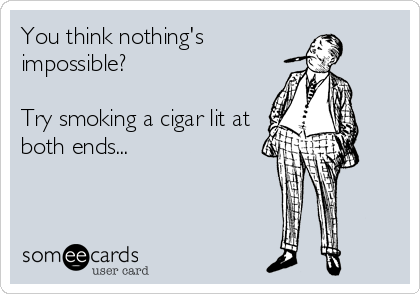 It’s rare to find a bad time to enjoy a cigar, and our team is skilled at finding the absolute perfect fit for your needs. DID YOU KNOW: The smell of tobacco from a freshly opened cigar box is called a bouquet? Additionally, Sunflower Pipes is proud to now hold an official tobacco license, and can offer up some of your favorite rolling tobacco and dip! Choose from TOP, American Spirit, Bugler, Bali Shag, Peter Stokkebye, Skoal, and America’s Best. DON’T FORGET: Our selection of rolling machines is an excellent way to ensure nothing slips out, and your cigarette is perfectly rolled! Customers have said these have completely changed the way they smoke, and we’d like to spruce up your smoke circle with a splash of organized rolling. Stop by 12 Wilson Avenue in Bushwick TODAY, and give our team the opportunity to find you a wonderful new addition at an exceptionally low price. Your satisfaction is our guarantee, and we look forward to your next visit!